To Cite: Bakhshi B, Boustanshenas M, Akbari M, Majidpour A. Cluster Analysis and Genetic Characterization of Enterobacter cloacae Complex from Blood Cultures, Jundishapur J Microbiol. 2019 ; 12(1):e67663. doi: 10.5812/jjm.67663. Background: Enterobacter cloacae bacteremia is reported as an important cause of morbidity and mortality. The members of E. cloacae complex are clinically involved in nosocomial infections. Objectives: The purpose of this study was to investigate the prevalence of E. cloacae complex and its members in blood samples and conduct the hsp60 cluster analysis and genotyping of the isolates. Methods: Eight isolates of E. cloacae complex were collected from blood cultures of hospitalized patients during the study period (December 2012 to November 2013). The hsp60 sequencing was done for the genetic classification. Pulsed-field gel electrophoresis (PFGE) was used for genotyping of the isolates. Results: Fifty percent of the isolates belonged to two E. hormaechei subspecies. Three isolates (37.5%) clustered within genotype III while only one isolate fitted cluster XIII genotype (12.5%). Pulsed-field gel electrophoresis analysis revealed four different pulsotypes. Conclusions: Different E. cloacae complex species and subspecies unequally contribute to the pathogenesis of blood infections and the subspecies of E. hormaechei were found to be most prevalent. Moreover, the common E. cloacae pulsotypes were observed to essentially produce identical hsp60 sequence types, indicating the probable clonality of isolates with identical pulsotypes. Enterobacter cloacae is related to Enterobacter species (1). It has been estimated that E. cloacae complex is responsible for 5% of bloodstream infections; hence, it can be considered an important nosocomial pathogen (2). Enterobacter cloacae complex (ECC) has been found in various environmental niches (3) and it displays broad phenotypic and genotypic profiles as reported all over the world. According to the results of recent studies, it has been demonstrated that the members of ECC are opportunistic pathogens that can cause nosocomial outbreaks. A variety of infections has related to E. cloacae including urinary tract, lung, blood, skin, and wound infections and pneumonia (4). Bloodstream infection caused by ECC has become a serious threat in nosocomial infection control in the last decade. Regarding previous studies, many risk factors can induce the septicemia related to ECC including invasive procedures, antibiotic therapy diet, prolonged hospitalization, and immunosuppressive therapies (5, 6). Although the classification of ECC species has been performed based on phenotypic methods, molecular approaches have played critical roles in the delineation of ECC in recent decades. According to a study by Hoffmann and Roggenkamp, the ECC can be classified into 13 genetic clusters based on the sequence analysis of the hsp60 gene sequence (5). Almost 10 different species in ECC have been demonstrated to cause nosocomial infections in the wound, lung, and urinary tract, especially in intensive care units. The phylogenetical relationship between different species among ECC plays a critical role in the determination of the infection source and nosocomial infection control. Earlier studies have revealed that the prevalence of E. hormaechei and cluster III is higher than that of other strains or clusters of ECC in clinical samples (5, 7-9). The species type and related genetic cluster of ECC can vary in different clinical samples; for instance, an analysis of infections pertaining to orthopedic implants revealed that the most prevalent strains of ECC were E. hormaechei subsp. Steigerwaltii and oharae, while the members of cluster III were more common in other anatomical samples (10). Moreover, the analysis of E. hormaechei strains involved in a nationwide outbreak revealed that these strains harbored the genes associated with resistance or putative virulence located on mobile genetic elements. These properties might contribute to high genomic plasticity and epidemicity (11). Previous studies demonstrated a lateral gene transfer between E. cloacae and other Enterobacteriaceae, which is caused by mobile genetic elements (12). These findings emphasize the evolutionary potential of the members of ECC for the acquisition of virulence and drug resistance determinants (13). Since E. cloacae bacteremia can cause mortality and morbidity in different parts of the world, evenly in both developed and developing countries, particularly Iran, acquisition of information about this organism and its genetic characterization can play a critical role in the prevention and treatment of the related infection. The study was designed to determine the prevalence of E. cloacae complex and its members in blood samples, as well as to classify the isolates via analyzing the distribution of hsp60 clusters and genotyping of the isolates by the pulsed-field gel electrophoresis (PFGE) technique. The present study was approved by the ethics and research committee of Iran University of Medical Sciences (IR.IUMS.REC.1393.24894). The sample size was calculated according to the sample size calculating formula by the statistical advisor of the project considering the prevalence of E. cloacae isolated from blood culture specimens. In this study, eight E. cloacae species were isolated from 4986 blood cultures of hospitalized patients from three large teaching hospitals in Tehran, Iran, from December 2012 to November 2013. In total, 10% of all the samples were positive for bacterial pathogens among which, eight belonged to ECC. The blind blood culture method was used. In brief, blood culture bottles were incubated at 37°C for up to seven days until the microbial growth appeared. The blood culture bottles were subcultured onto blood agar, chocolate agar, and MacConkey agar at 37°C for at least 48 hours. The phenotypic identification of E. cloacae strains was performed using an API 20E system (BioMerieux, France). The results were interpreted with the analytical profile index database of the API Lab Plus software (API web stand-alone V 1.2.1; BioMerieux, Marcy l’Etoile, France) (14). Enterobacter cloacae PTCC 1003 (Persian Type Culture Collection) and E. cloacae PTCC 1798 were kindly provided by the IROST (Iranian Research Organization for Science and Technology) and used as positive controls. All of the E. cloacae strains showed at least 95% identity with E. cloacae by API 20E and they were assigned the code number 3.305.573.57. The boiling method was used for the preparation of bacterial DNA for PCR analysis. Fresh bacterial colonies were suspended in distilled RNase/DNase free water and boiled for 10 minutes, followed by centrifugation at 10,000 rpm for 10 minutes. The partial sequencing of the hsp60 gene was done as described previously (5). Briefly, the hsp60 gene (341 bp) was amplified using two primers hsp60-F (5’GTAGAAGAAGGCGTGGTTGC3’) and hsp60-R (5’ATGCATTCGGTGGTGATCATCAG3’). The PCR was performed in a reaction mixture (total volume 25 µL) containing 15.6 µL sterile RNase/DNase free water, 2.5 µL 10X Taq polymerase buffer, 0.3 µL dNTPs (10 mmol L-1), 0.5 U Taq DNA polymerase, 25 pmol of each primer, 0.6 µL of MgCl2 (500 mM), and 5 µL of template DNA. Amplification was performed with the following program: Initial denaturation at 94°C for 5 minutes, followed by 30 cycles consisting of denaturation (94°C for 30 seconds), annealing (57°C for 30 seconds), and extension (72°C for 60 seconds). PCR was performed on a Bio-Rad MJ mini gradient thermal cycler. The PCR products were subjected to 1% agarose gels electrophoresis. Direct sequencing was performed with an ABI 3730X capillary sequencer (Genfanavaran; Macrogen, Seoul, Korea) using the forward strand of the amplified hsp60 gene. The 341-bp sequences of the hsp60 gene from the eight strains were deposited in GenBank under the accession numbers: KY549335, KY549336, KY549337, KY549338, KY549339, KY549340, KY549341, and KY746355. The sequences were compared with 46 reference sequences from the previously described strains in taxonomic studies, 10 type sequences strains (5, 10), and two positive controls (PTCC 1798 and PTCC 1003) using the MEGA software. The PulseNet standardized protocol was used for subtyping of Enterobacter spp. (15). In brief, the bacterial suspensions were prepared using the overnight grown cultures of bacteria and cell suspension buffer (100 mmol L-1 Tris, 100 mmol L-1 EDTA, pH 8.0). The bacterial suspensions were adjusted to a concentration of equal to the optimal density of 0.8 - 1.0 at 610 nm wavelength. Agarose plugs were made by cell suspensions, SeaKem Gold agarose (Lonza, Rockland, ME, USA), and proteinase K, treated with lysis buffer (50 mmol L-1 Tris, 50 mmol L-1 EDTA (pH 8.0), 1% sarcosine, and 0.5 mg proteinase K) at 54°C for 1 hours. Washing steps were done with sterile ultrapure water and TE buffer (10 mmol L-1 Tris, 1 mmol L-1 EDTA, pH 8.0) twice and four times, respectively. After washing, 40 units of XbaI restriction enzyme (Roche Diagnostic, Mannheim, Germany) were added to the digestion of plug embedded DNA. Salmonella enterica serotype Braenderup H9812 was used as a DNA size marker. A CHEF Mapper XA System (Bio-Rad) was applied for electrophoresis with 200 V at 14°C for 18 hours with the increasing pulsed time from 2.16 to 54.17 seconds. The Gel Compare II version 4.0 software (Applied Maths, Sint-Martens-Latem, Belgium) was used to analyze the PFGE patterns. The patterns were compared using the Dice coefficient and unweighted pair-group method using arithmetic averages (UPGMA) clustering. A dendrogram was constructed using an optimization value of 0.5% and a position tolerance of 1.0%. Each isolate was allocated to its individual species, subspecies, or genotypes by the sequence analysis of the 341-bp fragment of the hsp60 gene. A neighbor-joining tree was constructed including all clinical type and reference strains of the ECC, as well as additional type strains of the Enterobacter genus as out-group (Figure 1). Four of the 13 genotypes and species reported so far were also found in our study. Four of the eight isolates (50%) were found belonging to two E. hormaechei subspecies, three of which (37.5%) were identified as E. hormaechei subsp. Steigerwaltii, while one isolate (12.5%) clustered with the E. hormaechei type strain (E. hormaechei subsp. oharae), suggesting that E. hormaechei was the most eminent in our collection of bloodstream infections. Three isolates (37.5%) clustered with the strain of genotype III and were the second most frequent genotypes of the ECC. Cluster XIII (sequence crowd cluster) was found in one isolate (12.5%) and the other clusters were absent among the isolates in this study. All frequencies are summarized in Table 1. Table 1. 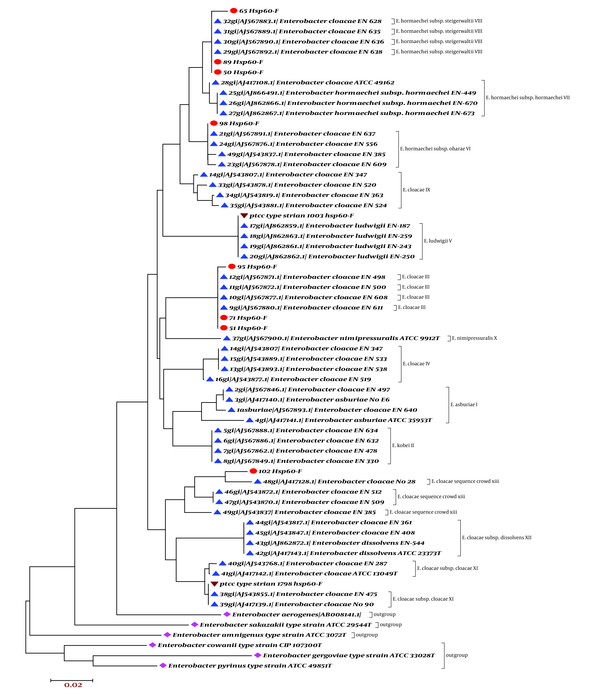 Distribution of Clinical Strains Within the Genetic Clusters of E. cloacae Complex Derived From the hsp60 Sequencing. Figure 1. Neighbor-joining (unrooted tree) resulting from the analysis of 341 nucleotides (78 variables) of the hsp60 gene sequences of nine clinical strains from blood cultures and 46 references and 11 type strains of the genus Enterobacter. Reference strain outgroup strains Persian type culture collection. Fingerprints with approximately 7 to 12 bands per isolate were detected as the results of PFGE (Figure 1). According to the criteria of Tenover and colleagues the isolates would be considered belonging to the same clone if PFGE patterns differed by fewer than two restriction sites (16). One of eight strains was not typable and did not produce a distinguishable pattern even after multiple attempts (E. cloacae sequence crowed XIII). The PFGE analysis revealed four different genotypes, among which two were common types and two were single types. The common type A comprised two strains and the common type B involved three strains. The remaining two strains (single clonal type) produced distinguishable PFGE patterns that indicated the absence of any clonal relationship with the common types (Figure 2). Data were statistically analyzed by the chi-square test using SPSS software V.22. A significant correlation (P < 0.05) was observed between the hsp60 sequence type of the isolates and related pulsotypes. The isolates were assigned to common hsp60 subspecies and clusters were uniformly allocated within PFGE common types. This phenomenon strongly suggests the clonality of E. cloacae isolates with identical PFGE profiles. Due to the high level of similarity in phenotypic features of the strains belonging to different species and subspecies of ECC, the sequencing of the hsp60 gene was introduced to distinguish between different strains with similar phenotypic profiles. This approach has been shown extremely high resolution in differentiating the species, sub-species, and genotypes of the studied complex. In the present study, the majority of the isolates belonged to the subspecies of E. hormaechei, followed by E. hormaechei subsp. Steigerwaltii, and E. hormaechei subsp. oharae. This is in agreement with a study by Kremer and Hoffman who showed that the subspecies of E. hormaechei are the most common ones in E. cloacae complex isolated from blood cultures, while the second most prevalent one was reported to be E. cloacae III in their study (9). Moreover, Stumpf and colleagues showed that the frequency of E. cloacae III and E. hormaechei subsp. oharae was 78% and 22%, respectively, among the 23 members of E. cloacae complex isolated from blood cultures (17). Our previously published data indicated that the majority (64%) of E. cloacae isolates originating from urinary tract infections (18) belonged to three E. hormaechei taxa, which comprised the foremost dominant species of our collection with the best clinical relevance to UTI (19). Moreover, Morand and colleagues demonstrated that clusters III, VI, and VIII in non-orthopedic clinical samples and clusters VI and VIII in orthopedic samples were the most common clusters (10). In other studies, it has been confirmed that the subspecies of E. hormaechei including subsp. Steigerwaltii and E. cloacae III are the most prevalent subspecies in E. cloacae complex isolated from clinical samples (5, 9, 10). Interestingly, the majority of multi-drug resistant strains are related to the strains within cluster VIII (20, 21). The fingerprinting profile of all isolates was determined using the PFGE technique and the related dendrogram was generated to assess the clonal relatedness of the isolates. Accordingly, four pulsotypes (A to D) were obtained from seven strains, two of which (pulsotypes A and B) were assigned as common types (Figure 2). The most dominant one was pulsotype B, which was identified in three strains. The isolates with identical hsp60 subspecies and clusters uniformly distributed within PFGE common types. It was elucidated in our previous study that the E. cloacae isolates obtained from UTI with common PFGE genotypes belong to identical hsp60 clusters but similar to the present one. There were particular individual pulsotypes that could be assigned in common hsp60 clusters (5). This suggests (i) the PFGE has more discriminatory power than hsp60 genotyping and (ii) the circulation of common hsp60 genotypes among different hosts might lead to the occurrence of multiple point mutations and affect the related PFGE genotypes. Stumpf and colleagues also reported the high discriminatory power of PFGE method than hsp60 sequencing in distinguishing the clonality of clinical isolates (17). In conclusion, this is the first report from Iran concerning hsp60 cluster analysis and PFGE genotyping of E. cloacae isolates of blood cultures origin. No previous study has reported genotypes and subspecies/clusters of E. cloacae isolates from blood origin. The subspecies of E. hormaechei and genotype III are the most prevalent genotypes of the E. cloacae complex in blood cultures. This confirms that E. cloacae genotypes and clusters have an unequal contribution to the pathogenesis of blood infections. Moreover, common E. cloacae pulsotypes essentially produce identical hsp60 sequence types, indicating the probable clonality of isolates with identical pulsotypes and the higher discriminatory power of PFGE compared to hsp60 sequence typing. This work was supported by the Antimicrobial Resistance Research Center, Iran University of Medical Sciences, Tehran, Iran. Authors' Contribution: Bita Bakhshi and Mina Boustanshenas designed the study and drafted the manuscript; Majid Akbari performed the experimental methods on bacterial strains; Ali Majidpour consulted the study as the infectious diseases specialist. Financial Disclosure: The authors declare that no competing financial interests exist. Funding/Support: This study was financially supported by the Antimicrobial Resistance Research Center, Iran University of Medical Sciences, Tehran, Iran. 1. Chen CH, Huang CC. Risk factor analysis for extended-spectrum beta-lactamase-producing Enterobacter cloacae bloodstream infections in central Taiwan. BMC Infect Dis. 2013;13:417. doi: 10.1186/1471-2334-13-417. [PubMed: 24010678]. [PubMed Central: PMC3846452]. 2. Fernandez-Baca V, Ballesteros F, Hervas JA, Villalon P, Dominguez MA, Benedi VJ, et al. Molecular epidemiological typing of Enterobacter cloacae isolates from a neonatal intensive care unit: Three-year prospective study. J Hosp Infect. 2001;49(3):173-82. doi: 10.1053/jhin.2001.1053. [PubMed: 11716634]. 3. Halda-Alija L, Hendricks SP, Johnston TC. Spatial and temporal variation of enterobacter genotypes in sediments and the underlying hyporheic zone of an agricultural stream. Microb Ecol. 2001;42(3):286-94. doi: 10.1007/s00248-001-0021-0. [PubMed: 12024254]. 4. Mezzatesta ML, Gona F, Stefani S. Enterobacter cloacae complex: Clinical impact and emerging antibiotic resistance. Future Microbiol. 2012;7(7):887-902. doi: 10.2217/fmb.12.61. [PubMed: 22827309]. 5. Hoffmann H, Roggenkamp A. Population genetics of the nomenspecies Enterobacter cloacae. Appl Environ Microbiol. 2003;69(9):5306-18. doi: 10.2217/fmb.12.61. [PubMed: 12957918]. [PubMed Central: PMC194928]. 6. Yogaraj JS, Elward AM, Fraser VJ. Rate, risk factors, and outcomes of nosocomial primary bloodstream infection in pediatric intensive care unit patients. Pediatrics. 2002;110(3):481-5. doi: 10.1542/peds.110.3.481. [PubMed: 12205248]. 7. Delmas J, Breysse F, Devulder G, Flandrois JP, Chomarat M. Rapid identification of Enterobacteriaceae by sequencing DNA gyrase subunit B encoding gene. Diagn Microbiol Infect Dis. 2006;55(4):263-8. doi: 10.1016/j.diagmicrobio.2006.02.003. [PubMed: 16626902]. 8. Paauw A, Caspers MP, Schuren FH, Leverstein-van Hall MA, Deletoile A, Montijn RC, et al. Genomic diversity within the Enterobacter cloacae complex. PLoS One. 2008;3(8). e3018. doi: 10.1371/journal.pone.0003018. [PubMed: 18716657]. [PubMed Central: PMC2515634]. 9. Kremer A, Hoffmann H. Prevalences of the Enterobacter cloacae complex and its phylogenetic derivatives in the nosocomial environment. Eur J Clin Microbiol Infect Dis. 2012;31(11):2951-5. doi: 10.1007/s10096-012-1646-2. [PubMed: 22648160]. 10. Morand PC, Billoet A, Rottman M, Sivadon-Tardy V, Eyrolle L, Jeanne L, et al. Specific distribution within the Enterobacter cloacae complex of strains isolated from infected orthopedic implants. J Clin Microbiol. 2009;47(8):2489-95. doi: 10.1128/JCM.00290-09. [PubMed: 19515837]. [PubMed Central: PMC2725656]. 11. Paauw A, Caspers MP, Leverstein-van Hall MA, Schuren FH, Montijn RC, Verhoef J, et al. Identification of resistance and virulence factors in an epidemic Enterobacter hormaechei outbreak strain. Microbiology. 2009;155(Pt 5):1478-88. doi: 10.1099/mic.0.024828-0. [PubMed: 19372158]. 12. Paauw A, Fluit AC, Verhoef J, Leverstein-van Hall MA. Enterobacter cloacae outbreak and emergence of quinolone resistance gene in Dutch hospital. Emerg Infect Dis. 2006;12(5):807-12. doi: 10.3201/eid1205.050910. [PubMed: 16704842]. [PubMed Central: PMC3374434]. 13. Ohad S, Block C, Kravitz V, Farber A, Pilo S, Breuer R, et al. Rapid identification of Enterobacter hormaechei and Enterobacter cloacae genetic cluster III. J Appl Microbiol. 2014;116(5):1315-21. doi: 10.1111/jam.12439. [PubMed: 24428402]. 14. Stoesser N, Sheppard AE, Shakya M, Sthapit B, Thorson S, Giess A, et al. Dynamics of MDR Enterobacter cloacae outbreaks in a neonatal unit in Nepal: Insights using wider sampling frames and next-generation sequencing. J Antimicrob Chemother. 2015;70(4):1008-15. doi: 10.1093/jac/dku521. [PubMed: 25558071]. [PubMed Central: PMC4356206]. 15. Ribot EM, Fair MA, Gautom R, Cameron DN, Hunter SB, Swaminathan B, et al. Standardization of pulsed-field gel electrophoresis protocols for the subtyping of Escherichia coli O157:H7, Salmonella, and Shigella for PulseNet. Foodborne Pathog Dis. 2006;3(1):59-67. doi: 10.1089/fpd.2006.3.59. [PubMed: 16602980]. 16. Tenover FC, Arbeit RD, Goering RV, Mickelsen PA, Murray BE, Persing DH, et al. Interpreting chromosomal DNA restriction patterns produced by pulsed-field gel electrophoresis: Criteria for bacterial strain typing. J Clin Microbiol. 1995;33(9):2233-9. [PubMed: 7494007]. [PubMed Central: PMC228385]. 17. Stumpf AN, Roggenkamp A, Hoffmann H. Specificity of enterobacterial repetitive intergenic consensus and repetitive extragenic palindromic polymerase chain reaction for the detection of clonality within the Enterobacter cloacae complex. Diagn Microbiol Infect Dis. 2005;53(1):9-16. doi: 10.1016/j.diagmicrobio.2005.04.003. [PubMed: 16182074]. 18. Salouti M, Mirzaei F, Shapouri R, Ahangari A. Synergistic antibacterial activity of plant peptide MBP-1 and silver nanoparticles combination on healing of infected wound due to Staphylococcus aureus. Jundishapur J Microbiol. 2016;9(1). e27997. doi: 10.5812/jjm.27997. [PubMed: 27099683]. [PubMed Central: PMC4834128]. 19. Akbari M, Bakhshi B, Najar Peerayeh S. Particular distribution of Enterobacter cloacae strains isolated from urinary tract infection within clonal complexes. Iran Biomed J. 2016;20(1):49-55. [PubMed: 26498349]. [PubMed Central: PMC4686808]. 20. Mokracka J, Koczura R, Pawlowski K, Kaznowski A. Resistance patterns and integron cassette arrays of Enterobacter cloacae complex strains of human origin. J Med Microbiol. 2011;60(Pt 6):737-43. doi: 10.1099/jmm.0.027979-0. [PubMed: 21330416]. 21. Hoffmann H, Sturenburg E, Heesemann J, Roggenkamp A. Prevalence of extended-spectrum beta-lactamases in isolates of the Enterobacter cloacae complex from German hospitals. Clin Microbiol Infect. 2006;12(4):322-30. doi: 10.1111/j.1469-0691.2006.01360.x. [PubMed: 16524408].